Use the Export>HPGL/2 function to export the currently visible viewspace or selected entities to the HP/GL2 format. There is no standard file extension for this format. By default, files exported through this method are appended with the extension of (*.HP). You are able to specify another extension if you would like, however. NOTE: *.PLT is the common extension used with this method of translation. Select HPGL/2 from the File>Export submenu. The Save As dialog appears, through which you can specify a file name and destination for the exported file. When selected, you are allowed to select the paper size. 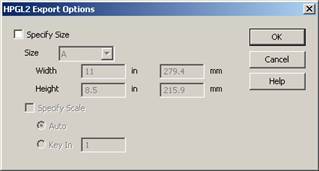 If you select Key In, type the desired size in the Width and Height fields. This check box is enabled when the Specify Size check box is selected. When the Specify Scale check box is selected, you are allowed to scale your part to the paper size without distorting the part. Scale determines the ratio of part size to paper size. You can allow the program to determine the scale automatically (Auto), or you can choose your own scale (Key In). Auto scales the part to reach the extents of the paper margins automatically. Key In allows you to enter a scale value manually.